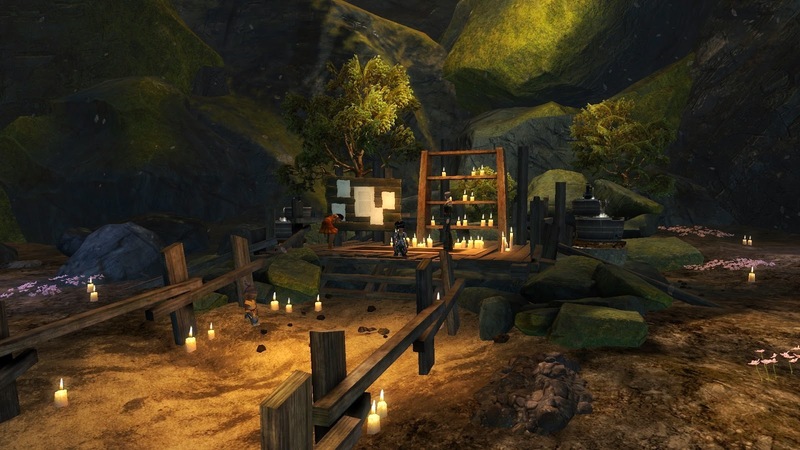 As hobbies and pastimes go, playing MMOs demands a remarkable degree of flexibility. Other obsessions demand far less of their adherents when it comes to re-adjustment of attitude, expectation and performance. The rules of golf or crown green bowling don't change every couple of months, for example, nor do you arrive at the ocean one day only to discover that you need to learn an entirely new way to scuba dive because the old way doesn't work any more. MMOs change all the time. They always have. Whether the pace of change is increasing or whether it's just that nowadays a lot of us play more MMOs and therefore see more changes stacked tighter together in time I'm not sure. I think it's most likely both. It's not easy to cast one's mind back ten or fifteen years and recall ordinary, day-to-day events. Not with any clarity, at least, as anyone who's ever consulted an old diary will attest. Certain events stick in the mind, often those that we polish up to a lapidary gleam and hand out as anecdotes over the years, but memories of most of the things that we did just for the day fade fast. With that caveat, it does seem to me that, when I played Everquest or Dark Ages of Camelot or The Realm back at the very beginning of the 21st Century, major changes to systems within MMOs that I played came along less frequently. What's more, when they did, less was required of me as a player to adjust to them. Number-crunching! It's what I live for! Over the past few years it seems to have become the norm for MMO developers to rebuild the ship while it's still out at sea, rather than wait until it's safely hoisted out of the water on the dry dock of an expansion. I've lost count of the number of times EQ2 has revamped its Alternative Advancement system so radically that a complete points refund has been required, for example. Even SOE must finally have realized the potential negative affect this could be having on their players because last time round they automated the recovery process and added predetermined upgrade paths. 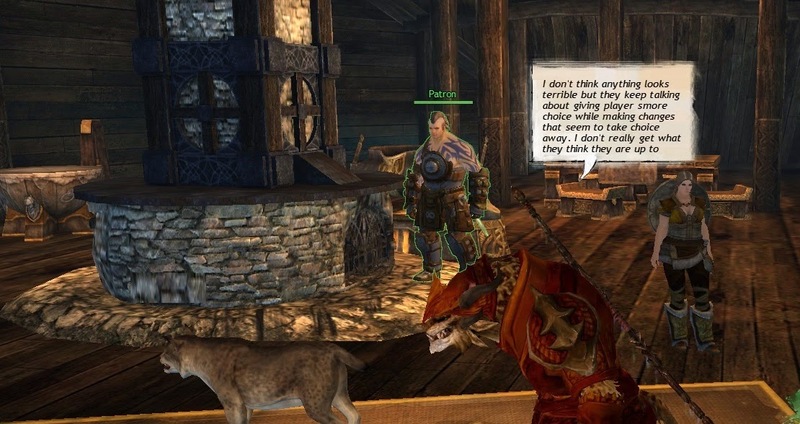 Rift did something very similar at quite an early stage, when they began twiddling about with way Soul Points worked there and I believe so did Lord of the Rings Online with the recent changes to that game. Providing a quick fix for players who resist, resent or simply log in unaware of these changes is a wise plan. While there certainly is a significant and vocal demographic within the hobby that relishes Year Zero resets and many who get very excited over builds, yearning for more opportunities to bury their heads in statistics and possibilities, there are plenty who see the whole,thing as a royal pain. Even for those who are willing to spend time getting a build just right, as Keen found, when he launched himself headlong at the ESO head start and bounced off the Wall of Choice, sometimes too much freedom is no freedom at all. In any probability distribution set for readiness to adopt options to change within MMOs I'd almost certainly be an outlier. For the most part, once a character I'm playing ceases to level he also ceases to change. It's at that point that I will usually optimize his gear and build and then that's him finished. No, more than that, that's who he is. From then onwards that character will take what virtual life throws at him and deal with it as best he can with what he has. Tweaking builds from that point onwards is not an attractive option for me but an onerous chore. Unless, of course, I happen to be in the mood for a good old fiddle. Once in a while, on a whim and usually on a Sunday afternoon, I might take it into my head to revisit a character's traits or points or whatever it may be. I might spend a while moving things around. More than that, I might thoroughly enjoy myself doing it. Oh, the inconsistency of it all. Largely, of course, it's being imposed upon by outside forces that irks. If I'm in the mood to spend most of that Sunday afternoon changing my Elementalist from a water staff support build to a full Zerker rain of fiery death build then that's my business and my fun. If I log in after a tiring day at work just looking to zone out while I do my dailies only to find that before I can even start I have to respend all my points, which in turn means researching a new build and learning how to play it, then I'm likely to balk at that first hurdle, close down that game and go somewhere else. Choice is only choice when it's your choice. When MMO developers decide the time is right to revamp these systems they are exercising their right to choose to do what they feel is in the best interests of the game. If the game is strong enough and the changes are sound then even reluctant outliers like me will be carried along on the tide of enthusiasm. Once. Maybe even twice. Keep at it, though, and in the end those returned points will go unspent, the characters unreformed, the game unplayed. Can always use a little more zap. That was one reason, albeit not the main reason, I stopped playing Rift. It's one reason, again not the main reason, Mrs Bhagpuss (who is even more resistant to these things than I am) has stopped playing EQ2. It's a risky process. Every systemic change will fire up some players, pass as a necessary adjustment for many more and alienate others. Developers need to be confident in making those changes the game needs to remain fresh and entertaining while resisting the desire to keep moving the furniture around just to see if it looks better over there. 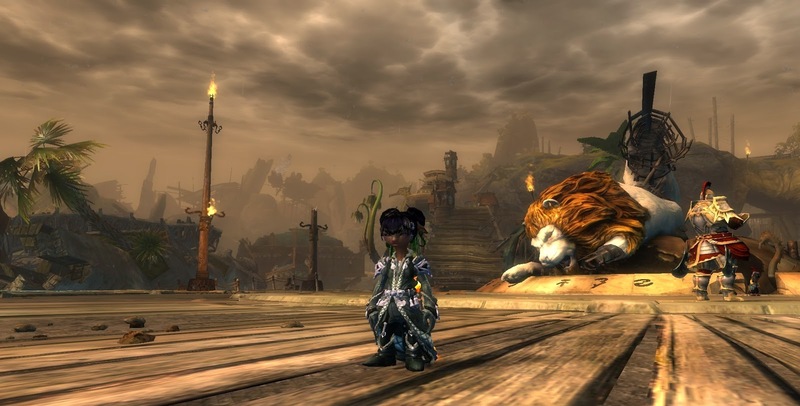 GW2 has managed to go a good long while without any major shake-ups to its systems. For all the fuss and bother it raised, ascended gear has proved to be eminently ignorable for those who choose to look the other way. The usual ongoing class revamps have represented nothing more than the eternal shortening of the legs to get the MMO table to stand straight that's been going on in every MMO ever, always. Now, eighteen months down the line, we at last face our first full systems revamp and I find myself cautiously looking forward to it. With no expansion either behind or before us and an end game that could uncharitably be described as "more of the same", for once having all my points back to respend on semi-new things seems like not such a bad idea. As for the ongoing free respecs in the interest of making it "much easier to experiment with and learn new builds", well I think I'll pass on that, thanks, ANet. Come April 15th I'll get my nine level 80s how I like them and perhaps you'd be so kind as to let me leave them that way for another eighteen months at least. 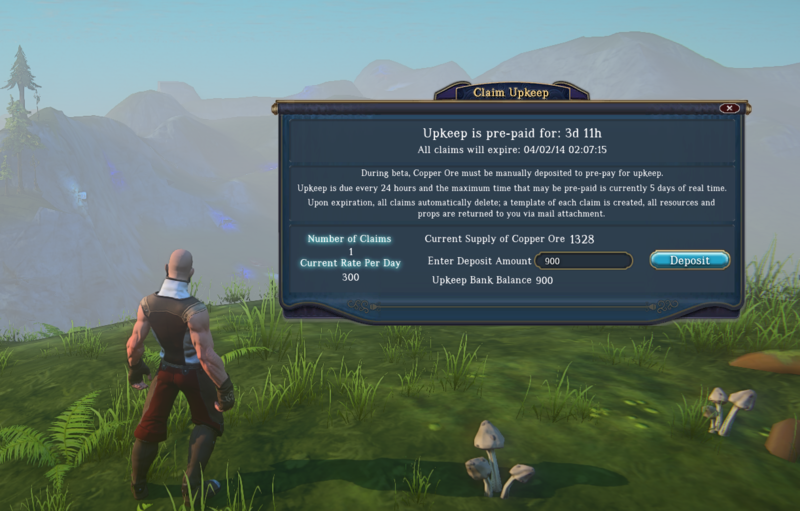 Landmark Closed Beta arrived this week, whipping up a flurry of blog posts as it blew in. Tobold senses disrespect for the Great European Vacation Tradition to which I say if you think that's disrespectful you ain't seen nothing yet! I refer you to the Alpha Screenshot Competition (NA Only - Rest of the World not invited), Player Studio (ditto but "we're working on it") and the whole PSS1 debacle. Rowan also has reservations about the upkeep system, all of which will, I believe, be satisfactorily resolved in due time. This is Alpha Beta, after all. Liore queries the crafting and questions whether front-loading gathering is such a good idea. The entire crafting system is going to change, so the Blueprint (formerly known as The Roadmap - SOE on a name-change roll, evidently) tells us. It's a good point all the same. SOE are determined Landmark's going to be a full-on MMO, not just a building set but how that's going to play out remains unclear. Will the hordes of casually interested free-to-players want to spend the first week or two gathering to make the tools they need before they can build anything? Is that how Minecraft and all these other build-your-own-castle games work? I don't know - I never played any of them. While we're on the subject of free Landmark beta keys I still have one left (two if Corpserun doesn't get in touch soon). There seem to be so many floating around that I imagine most anyone who really wanted one is fixed up already, but if not, first to ask in the comments gets one - just be sure and leave some means of contact so I can send it to you!. Last but definitely not least, Jeromai's first thoughts on Landmark turn out to be as detailed and considered as some people's full reviews. That's just a quick round-up of some of the posts that popped up in my Feedly and Blogroll. There must be many, many more. As for me, I haven't had much time to play or post so far. There's really no rush. Two things occurred to me as I was feverishly searching for Agate to (which it turned out I didn't need anyway) and getting all stressed about not finding any. Can we craft safety goggles yet? These woodchips really fly. The first is that Landmark is not a casual game. It really isn't. It does not benefit from a quick hour here and there, which means it may also not be the best game to play in the evenings after work, even if the actual "gameplay" can be so relaxing it becomes almost mesmeric. To get anything done requires big blocks of time and some serious commitment. If you're going to power down at the end of a session with a feeling of satisfaction you need to realize that everything you do in Landmark is going to take you a long time and progress will be slow and incremental. In that regard it really is an Everquest game, even if it's no longer officially part of the franchise. Maybe that will change when achievements, combat and loot are all in but for now I'm saving my energy for one of those long European holidays that Tobold mentioned, something of which I always get plenty around this time of year since I have to use-or-lose all my unspent vacation days by the end of April. The second is that, while SOE may call this a "Closed Beta", it might as well be launch. Yes, there is one guaranteed wipe coming, when caves and water are added and the world finds the form it will take from then onwards, but it's a wipe for the world, not for the players. When the servers come back up you will log back in as the exact same character with all the items you had, all the progress you have made, all your materials and props, everything. All your claims will have been auto-templated and the one thing left for you to do will be to reclaim and one-click rebuild. If any other wipes are needed we are promised the same service. If my character and all his possessions are persistent from here on, how is that any different from the game being Live? All MMOs are in constant flux - this one will just fluxate more than most for a while. That's me, dead in the middle, in every meaning of the expression. So, if this week marks the first step on a journey that may last many years, there's really no need to set off at a dead run. Which is just as well because I have something else distracting me. The Tourney aka WvW Season 2 began last night at 1 am UK time. I said I wasn't going to stay up for reset but of course I did and it was three in the morning and a couple more brandies than I was planning before I finally called it a night. I plumped for homeland defense and the battles to hold Hills as Borliss Pass and Sanctum of Rall pounded us with catapults and wave after wave of footsoldiers were some of the best I've had in WvW. I love keep defense and this was real horatio-at-the-bridge stuff, with a handful of Yaks wedged in the corridor to the Lord's Room, holding off much greater forces outside. It did look as though BP and SoR were co-ordinating strategy, although from what I saw when I was lying dead on the bridge and a flying wedge of SoR hit BP square in the back as they were pressuring us, the message may not have gotten down as far as the troops on the ground. The structure of The Tourney means that if we storm the first week (the way we stormed last week versus the same opponents) we'll be matched next week against other high points-scorers. Chances are that would mean Fort Aspenwood and Henge of Denravi, strongest and most-improved servers in Silver League respectively, which would mean a very tough week for Yaks Bend and one in which we could well come a distant third. After that, who knows? It's going to be a very interesting nine weeks and that's not even mentioning the Feature Pack and all the chaos that's going to bring. How much time all that will leave for building imaginary houses I wouldn't like to say. Following my introduction to Heroic Level 85 characters last week I find myself playing Everquest regularly once again and very happily so. Today my magician dinged 86. A level in a week is astonishingly swift progress by the standards I'd long become inured to on my 84th Beastlord. It feels very satisfying. The difference between the two characters, invisible if you look just at their levels alone, lies in the gear and in the AAs. I kitted the Beastlord out in the best tradeable gear available back in the autumn, when I had my last flurry of leveling. I checked the Bazaar last night and almost everything remains Best-in-Slot for buyable gear with any possible upgrades being marginal at best. By contrast, the armor that the mage was gifted by the Heroic upgrade is vastly superior, matching the non-tradeable equipment available in current group content. As for AAs, when I was leveling her my Beastlord had around 800. Heroic characters start with 4000, something the Beastlord can at least emulate with the February update's separate innovation of auto-granted AAs for Gold-Level accounts. Since such a huge proportion of a character's power and survivability in Everquest comes from Gear and AAs, that accounts both for the increased speed of leveling and how much fun I'm having. Call yourself a Lookout? Didn't see that coming, did you? So far I've been playing cautiously, doing Franklin Teek's tasks in the level 75 and 80 Hot Zones, currently Oceangreen Hills and Hills of Shade. Using the once-a-day Veteran Reward "Lesson of the Devoted", which doubles XP for thirty minutes, the mage has time to travel via Steamfont and Loping Plains to kill dark blue con Blackwater residents in the gloomy Hills of Shade then gate back and pass through the Plane of Time to the Void portal that leads to the timeslipped version of Qeynos Hills that is Oceangreen for some light-blue Grizzlies. Even allowing for bad pulls and having to clear annoying treants that see invisibility, it's easy enough to run this cycle with a few minutes left in the Lesson, coming out with somewhere around 10% of the level done. It's only possible, though, because of the many quality of life improvements that fifteen years of changes and updates have brought to this dowager of MMOs, while leaving her essential personality unchanged. For example the Perfected Invisibility and Perfected Levitation AAs mean the magician can travel in a straight line across entire zones, high above the agro range of all mobs, landing unseen at her chosen destination without fear of invisibility breaking unexpectedly. Her pet and mercenary are both ignored as well even though they remain perfectly visible. It would be very easy to argue that the removal of requirements for reagents such as bat wings for levitation, plus the absence of risk inherent in invisibility that can fade without warning, reduces the granularity that made Everquest so compulsively immersive in the first place. I'd be one who'd argue that. Except, of course, all that granularity still exists if you want it. Just make a new character and there it all is, or most of it, same as it ever was. No, I feel with increasing certainty that the time for such creative restrictions comes during the early years of an MMO's life, within the original levels and content with which it began. There they add much-needed texture and grit for a plyerbase still eager and willing to be drawn in to a fresh, new world. Later there comes a point when what was once involving risks becoming offputting. And anyway, it's not as though surprises and pitfalls don't lurk around every corner, even with all these modern contrivances and conveniences. Bloodmoon Keep from the air. Safest way to see it. Take my mage's little jaunt to Wall of Slaughter today. She'd taken Franklin Teek's Simple Task for level 70s just on the off-chance it would still give a dab of experience. Wall of Slaughter, a spectacularly ugly zone from the Omens of War expansion, is at the very lowest margin of zones in which she could expect to gain even a smidgin of xp, the mobs being mostly green or grey. Still, it's a 50 plat single from the Guild Hall portal to get there and a minute or two to complete the task, so why not? Knowing it as a zone the Beastlord can solo with ease I didn't bother with a mercenary. Just a magician and her air pet with a rag-tag of fading buffs from The Pile (jargon for the fifty or more characters always found huddling together in the Guild Lobby hoping for free buffs). She killed a couple of greens at the port-in just to calibrate - extremely easy - then headed out onto the baked mudflats, where the first thing she saw was a massive Bazu going by the name of Cipheron. At this point two things flashed through my mind; firstly NAMED!! and secondly a memory of the infuriating zonesweeper that made all our lives such a misery in WoS back in the day. With a combination of lust for loot and desire for payback I cast a debuff to pull and sent in the pet. It was only after half a dozen nukes, just as I was beginning to wonder why the mob's health had only dropped to 98% and why my pet was taking such a beating, that I realized my target was an even con. This is a moment to make an EQ player's blood run cold. In Everquest you do not blithely pull a boss mob of your own level, about which you know nothing, not if you expect to live for more than a few seconds longer. Oh, I'm so sorry. I mistook you for someone else. But Kabobn was holding up well enough, or at least he was now I'd noticed I needed to heal him. There was time to assess the situation. I decided not to gate, to carry on and see how things might play out. There followed one of the kind of fights I so relish in Everquest. It lasted about ten minutes as I juggled the responsibilities of keeping the pet upright, whittling away at Cipheron's mountainous health, managing my mana and agro, while choosing and using AAs to keep the pair of us on top of things. There was some kind of AE to avoid and once I lost valuable seconds wondering why I couldn't heal the pet before I noticed Cipheron had forced me to feign death so I was lying on the ground. It was tense for a while but in the end it was Cipheron on the deck and he wasn't feigning. When I searched the massive body there was no special loot, just a blank sheet of parchment the game told me I wasn't allowed to pick up. After I'd summoned the Merc just in case Cipheron had any friends, taken the victory shot and finished Franklin's task, which dinged me 86 so it was worth coming, I looked old Cipheron up on Allakhazam. Turns out he's part of the Enchanter 2.0 epic. In 2005 it took a 40 man raid to knock him over. Five years ago that was down to a single group and now he's soloable by a rusty, unprepared player on a false-premise pull. The Landmark alpha fades into the sunset today but never fear! In a couple of days it will rise from its shallow grave and lurch back to life as... Landmark Closed Beta! Everyone who bought a Trailblazer Pack gets four beta keys to give away. Originally they were supposed to be the temporary one-week kind but SOE, out of the kindness of their hearts, I'm sure, have upgraded the offer: all free Trailblazer keys now last for the whole of beta. I'm hoping to persuade Mrs Bhagpuss to donate one of hers for a giveaway here (haven't actually raised the idea yet...) but just in case that doesn't happen Isey at I Has PC might still have one left, if you're quick. The Tourney is just the new World vs World "Season" that everyone's either been anticipating or dreading since the last one ended, way back before Christmas, given a new lick of paint. 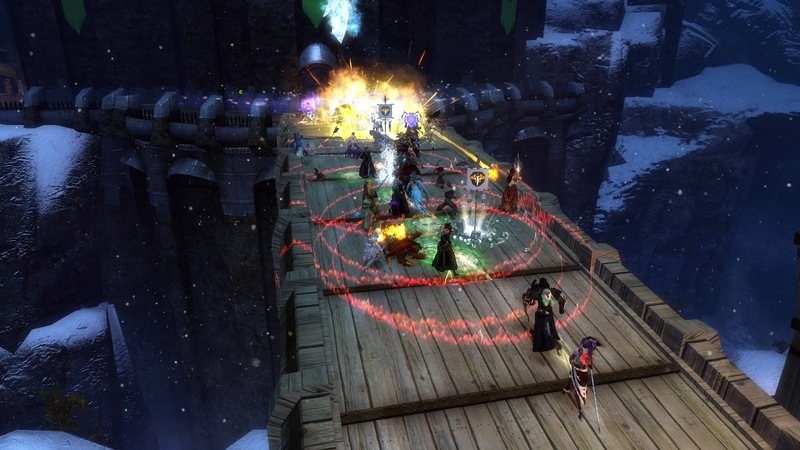 The Tournament of Legends is the latest step in the eternal plan to make GW2's PvP something that matters to someone other than the closed coterie it currently attracts, while keeping that coterie firmly onside. The only mildly surprising aspect is the prizes, which include Legendaries and Precursors. The Feature Pack - now that's something else entirely. It's a bundle of game-changing revisions, heavily trailed and hyped in a way that's frequently been misinterpreted and misunderstood by a segment of the playerbase, who've decided it's an expansion in everything but name. It's not an expansion but it looks set to disturb the peaceful waters every bit as much as a real expansion would, only without the ameliorating benefit of any actual content. It consists of ten Features, each of which gets its own separate news release/PR puff/blog post according to a schedule. So far we've had The Great Trait Revamp, Runes and Sigils and Crits. Dulfy, as always, has the clearest and most succinct overview. There's also apparently a Livestream, which I haven't watched because, frankly, life is just too short. We have a few days to digest the first three before Tuesday brings what looks to be something about outfits and dyes. There's some speculation that it'll be a Wardrobe and Account-Wide Dye System, a hint of which was apparently data-mined from the upcoming launch of GW2 in China. Further out floats a whole raft of mysteries culminating with an introduction to something enigmatically labelled "Friendly Play" that's apparently so momentous it not only comes as the climax of two weeks of PR blitz but requires three days to explain. Reaction on the official Forums has been surprisingly muted. There are no threadnaughts building, no protests forming, no harassed Moderators slapping down bans. In fact, no one seems all that interested, possibly because the changes so far announced are largely pushing against an open door. But..but..I liked being a Berserker! Nerf Berserker builds? Everyone saw that one coming (apart from me, it seems. I finally succumbed to the zeitgeist and spent all last Sunday converting my Elementalist to full zerk mode. Been enjoying it, too). Hunt your skills (okay, traits) in the wild, GW1 style? Should have been that way from the start is a popular view and for those that don't agree they'll all be vendor-purchasable anyway. Rationalize runes and sigils so they actually a) work and b) make sense? Who's going to argue with that? Well, people who spent a fortune on expensive upgrades that are no longer fit for purpose but hey, there are winners, there are losers, right? So far, so uncontroversial. Still, there's a lot of oddness in there when you dig down. For example, if the intention is to "foster a healthy balance environment that encourages players to experiment with their builds" how is that achieved by rationalizing Critical Damage and reducing it across the board by 10% ? As plenty of people are pointing out, in relative terms that that leaves a Berserker build exactly where it is now, at the front of the DPS parse, only in a new world where everyone's Time-To-Kill is reduced. As if they weren't already hard enough to kill. People are crunching the numbers but as yet we don't really have the numbers to crunch. 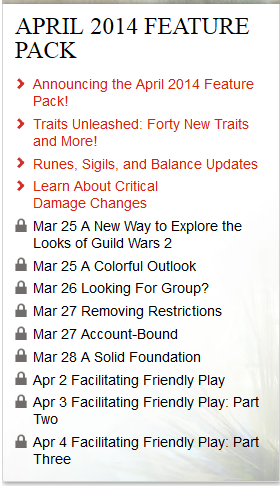 We don't know the full detail of the changes to runes, sigils and traits for one thing. Maybe when we see all the changes in action ANet's Grand Plan will fall into place and the Day of the Berserker will be over after all. I'm not holding my breath on that one, though. If there's any build that kills faster than the rest, it'll be the new orthodoxy within days of being discovered. "...we’re making it easier to understand the benefits of sticking with a single rune set....we simply want the PvE rune system to be as clear and approachable as possible for new players, so we’re making it easier to understand the benefits of sticking with a single rune set.". Why would ANet even care what runes a new player chooses to slot? I very much doubt the player does. Leveling up in GW2 is so straightforward, it really doesn't matter what gear you use, let alone what upgrades you put into it for the few hours you might keep any given piece of armor or weapon. When I was leveling up I just put in anything I found, if I bothered at all. Trying to convince new players it "matters" to have the "right" gear and the "right" upgrades is untrue and a terrible idea. Don't say it out loud! Someone might hear you! "...we’ve pushed back the level at which the different trait tiers unlock for new characters in order to better pace the early game experience and to add more meaningful character progression from levels 30 to 80. Starting with this feature pack, new characters will unlock the adept tier at level 30, the master tier at level 60, and the grandmaster tier at level 80." Because making new players wait longer until their character gets a fresh trick always makes things more fun, right? New players just love that! Nothing builds affection and loyalty to an MMO in a new player faster than making him use the exact same set of abilities for 20 or 30 levels at a stretch. Of course, as has been observed, not least by me, new players don't have the same points of comparison as veterans and so may not feel nerfs as strongly but even so, this logic does seem more than a tad unconvincing. The counter-argument would be that leveling in GW2 is already very fast and somewhat trivial and that anything that makes it feel more solid and substantial is at least worth trying. I'm sympathetic to that. On the other hand, unless there are some radical changes in the works then I would guess plenty of new players and most experienced ones are going to be bypassing the whole "better pace" by using one of the many existing means of avoiding the entire open-world leveling process altogether. Ah, but of course there are radical changes coming. There's that whole "Facilitating Friendly Play" thing. That's got to be radical if it's going to take three days to explain. There's been some wild speculation on what it could include; even some crazy talk about the implementation of player housing and Guild Halls. Good luck with that. I have my own theory, which I'll outline now so that I can look smug if it turns out to be anywhere close to the mark or an idiot if it turns out to be completely barking. From the changes so far announced I discern a pattern. My feeling is that, after a year and a half of seeing their game spin away in directions they almost certainly never expected or intended, they are going to attempt to wrestle it back onto the track they were hoping to travel before launch. 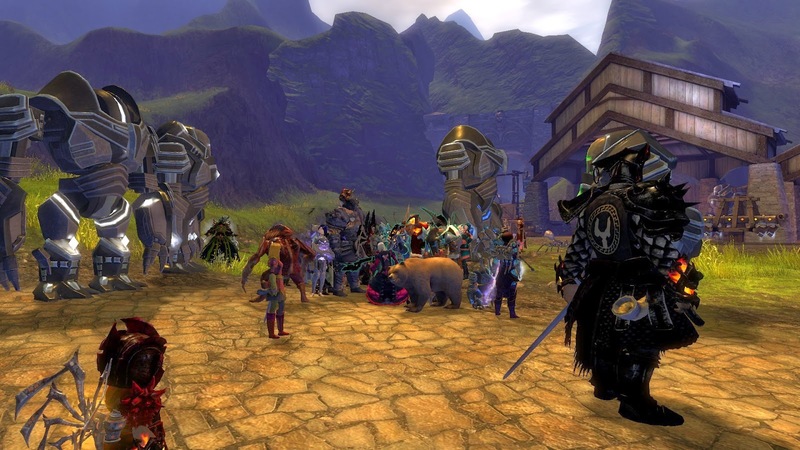 GW2 was very heavily touted as a paradigm shift in MMOs, where players would seamlessly co-operate with each other in an ever-changing, dynamic world. There would be no need for formal groups or raids since wherever players happened to find themselves in proximity all their efforts and rewards would be shared equally by default. Outside of instanced content, which at that time was only going to be a handful of dungeons and the Personal Story, we'd all be in it together. Over the months that promise has eroded. Fractals added a significant amount of instanced content that required formal grouping while players increasingly decided that all instance groups should follow a rigid formula. The Holy Trinity may have been at least partially expunged but it wasn't replaced by "pick five, any five". Meanwhile, open world content increasingly devolved to large gangs of roaming berserkers chasing Champions and meta-events in a never-ending lust for gold. Increasing utilities directed at helping others around us while at the same time reducing our ability to kill so quickly alone suggests an attempt to make both supporting and being supported by others a more valued and valid playstyle. Sending us out to hunt for our traits in all kinds of content, much of which I am guessing will not be easy to solo, adds motivation to find people to help. And it all fits with the clear direction of most of the Living Story updates this year - encouraging players to operate as a team, not just as individuals, in or out of a zerg. 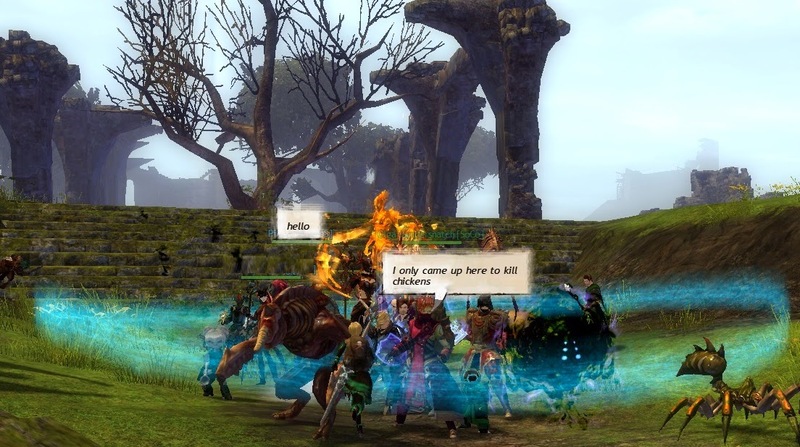 Anet have always been fond of social engineering. Most MMO developers are. It looks as though they've decided to come out into the open about it for once. That's my take, for what it's worth, and there's not long to wait to find out if I'm right. It's shaping up to be a very busy Spring and early Summer in MMOland. No, strike that - a busy year. Leaving aside the plethora of Kickstarters and indies we have The Elder Scrolls Online debuting in just over two weeks time on April 4th, followed by WildStar two months later on the third of June. EQN Landmark hasn't announced an official launch date but it goes into closed beta next Wednesday. One would imagine that open beta, which will to all intents and purposes be the launch, should come no more than two or three months after that. No-one seems to have made a firm booking for midsummer yet but there are couple of heavyweights eyeing the sand and flapping their towels meaningfully. There's UbiSoft's The Crew, originally scheduled for the Spring but put back until "Summer 2014" with no exact date, while Funcom's Lego Minifigures Online is flagged "coming Summer 2014". As the nights start to draw in Bungie have early Autumn covered with a September 9th launch pegged for their is-it-or-isn't-it MMOlike Destiny. Blizzard haven't nailed down an exact date (and Warlords of Draenor is "only" an expansion not a brand-new MMO) but they're taking pre-orders for "Fall 2014". Finally, at least in this shortlist of MMOs I'm vaguely paying attention to, Trion promise that by the end of 2014 we'll get our hands on the year-before-last's Next Big Thing - ArcheAge. And that's just takes us up to Christmas. Let's not even think about Star Citizen and EQNext waiting in the wings. So, with all this multiplicity of choice and glistening newness to slaver over, which MMO have I found myself most excited by these last few days? Everquest, of course. A fifteen-year old MMO that doesn't even have a new expansion out right now. Turns out all they needed to do was dangle the carrot of a free high-level character (not even max level you notice) and there I am, pushing my head back through the harness and taking up the strain. Most of yesterday was spent getting to grips with my newly-85 Magician. Getting the hang of the spells (Not difficult. Mostly "Burn it! Blast it! Burn them! Burn them some more!") and the AAs (going to need a free afternoon and a manual for those). Re-learning old skills (Pulling. Crowd-control. Handling adds. Finding my corpse). ...something I hadn't managed to do by the time we moved up a notch to Loping Plains. The four zombies I tagged while taking an ill-advised short-cut to the bottom of the long ramp down gave us a good work-out but standing on the grizzly bear conveyor belt outside Bloodmoon Keep proved to be too much. Talk about Bears! Bears! Bears! That's another skill to be re-learned, right there - choose your ground for a fight carefully, don't just stand somewhere random and start killing. 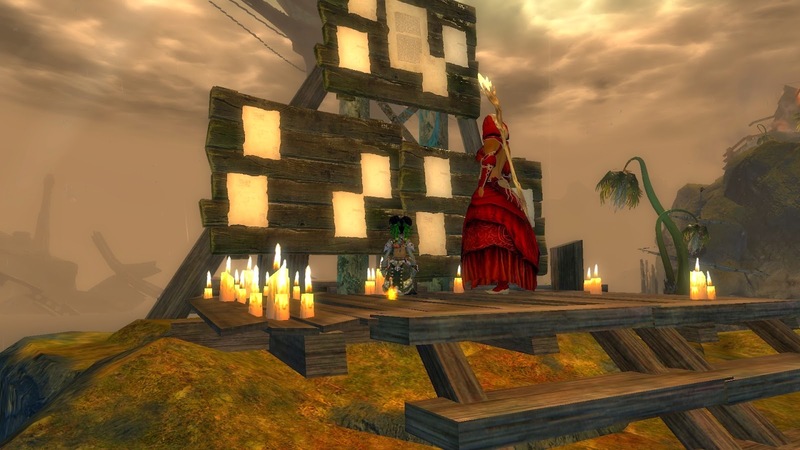 That kind of slack behavior might cut it in Tyria or Azeroth but this is Norrath. So, the pet died valiantly while the other two bravely ran away and the mage gated and back we all were (well, two of us and a new Kabobn) in the Guild Lobby, ready to go again. Boy, was the Guild Lobby busy, too. And Plane of Knowledge. And Hills of Shade, where we went to try and finish Franklin Teek's Hot Zone task. Everquest is heaving right now. At last we all felt confident and practiced enough to try somewhere our own level, so off we toddled to try Feerrott: The Dream. 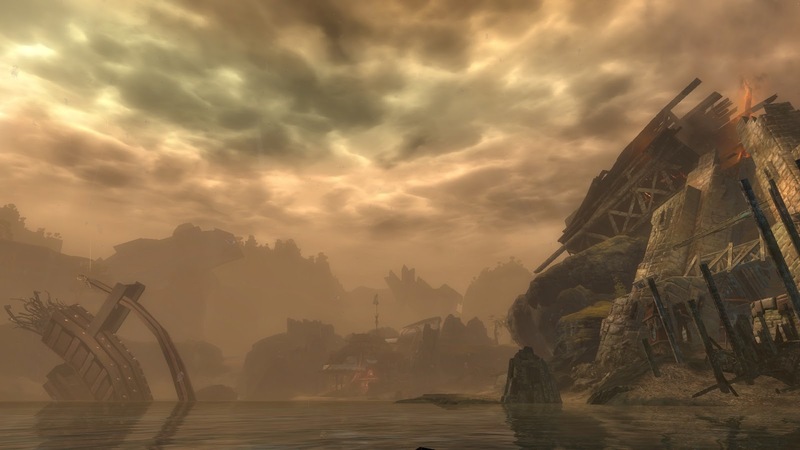 Over the past few years SOE have saved themselves a lot of trouble and kept a lot of long-time players reasonably happy by re-skinning existing zones as new, high-level content. They leave the old zones as they were and add timeslipped or dreamtouched versions alongside. It works really well and presumably saves a ton of design time. Oh look - isn't that Blizzard over there, taking notes? I haven't been keeping up with Everquest lore (when did I ever) so I don't know whose Dream we're in but Kaozz mentioned a quest just for Heroic 85s there so off we went. It was fun. It was profitable. It was quite hard. We all died. Twice. The first time I just paid the 500 plat to the NPC gouger Disciple in the Guild Lobby, gave the stone to the Priest, had her summon my corpse and let the Merc rez. The second time I was too mean to pay again plus I was confident I could get back to my body safely, not least because I'd spotted that Magicians get an AA for permanent unbreakable invisibility these days (okay, I hadn't spotted it so much as SOE had kindly slotted it onto the "Would like us to hold your hand for a bit?" hot bar they thoughtfully provide along with your free levels. I think they know what you're going to be using it for, too). Well, I couldn't find my corpse. Being a tiny gnome dressed entirely in green in an all-green swamp that maunders in perpetual twilight might have had something to do with it. That and forgetting you should always take a /loc when you die. I went and bought a Chipped Bone Rod in Plane of Knowledge but three charges of Find Corpse weren't sufficient to triangulate, at least not once I'd finished running from the Lizardman shaman who'd though to buff himself with See Invisible. I've always enjoyed a good corpse run but after about an hour the novelty was beginning to wear off. Luckily I had a bright idea. For the only other Heroic 85 I'd managed to make (just one of our several Silver accounts turned out to be valid, for reasons still unclear) I'd chosen Necromancer, a class I've always wanted to have at high level but somehow never did. Necros have always been able to track corpses and summon them and in this modern Norrath they no longer even need to go to the right zone or buy a coffin. Logged him in, grouped them up, summoned the corpse, Merc rezzed and the money-grubbing Priest and her creepy little disciple got nothing! Soooo satisfying. Back we went to The Dream. I considered towing the Necro but in the end I couldn't be doing with all the zoning and re-applying /follow so we left him standing in the Guild Lobby in case he was needed. He wasn't. Lessons had at last been learned. With more thoughtful pulling, standing and traveling the Mage and her little crew finished off the quest and received the flag for the Journeyman 5 Mercenary that I'll probably be too penny-pinching to pay for but at least we have the option now. The quest itself was pretty good. Simple to follow, sharply and amusingly written with good characterization in the expected tradition of Norrathian stereotypes (devious magic users, dimwitted-but-loveable ogres, tightfisted dwarves with dodgy Scot-ish accents...). The tasks required snapped along nicely, travel between points required your attention not your time, the final fight was big, loud and scary - and we won. What more could you ask for an afternoon's entertainment? Either way, I'm guessing that I won't be spending Spring or Summer in Tamriel or Nexus. It'll be anything up to three flavors of Norrath. And Tyria, too. The Living Story may be on hiatus but there's The Tourney to come at the end of March and that crazy Feature Patch in April (of which more here in due course as more is revealed. I just can't wait to find out what "Friendly Play" is and why it takes three separate announcements to explain it...). 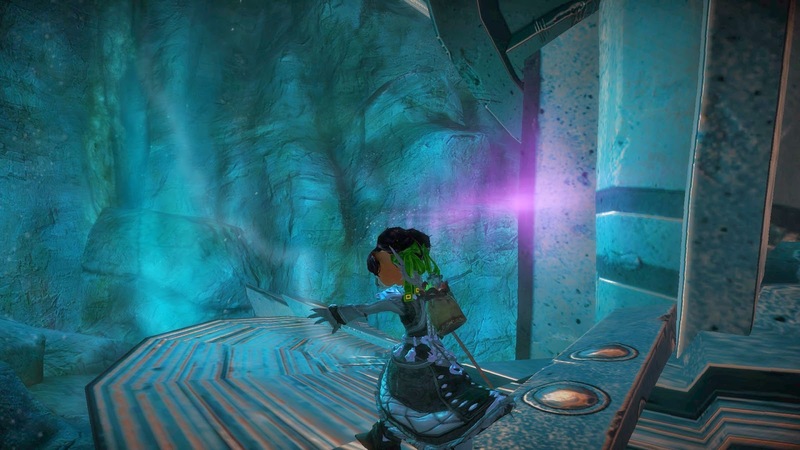 GW2 is a mere snapper compared to Everquest or even EQ2 but it's coming along, coming along. One thing's for sure. We're none of us going to have an excuse for being bored this year. If there's really nothing to take your fancy among that lot it might just be time to start thinking about a new hobby altogether. I was going to write a little something about the after-war party at Marjory's bar and the reaction thereto but Jeromai beat me to it. The first half of his post is pretty much the post I was going to write but instead of taking the day off I thought I'd carry on regardless and just use him as a trampoline. I read a whole thread on the official forums about the Aftermath update yesterday. It was almost 100% negative but not in an unpleasant way. Not in an inaccurate way, either. I found myself nodding now and then, especially over the distaste for some of the dialog options, one or two of which went right past inappropriate into downright offensive. Much of the dislike stemmed from the very things Jeromai picks out - supposed inconsistencies in the lore and the quality of the writing. GW1 lore is almost completely opaque to me so I'll pass on that but quality of writing is something I'm supposed not only to understand and recognize by dint of my education but which I'm required to be constantly aware of in my day job. I felt embarrassed to read this. Imagine if you'd written it. The comments in that thread along with Jeromai's observation that "It’s an MMO. It’s never going to be fine literature" really made me re-assess my own complacency. 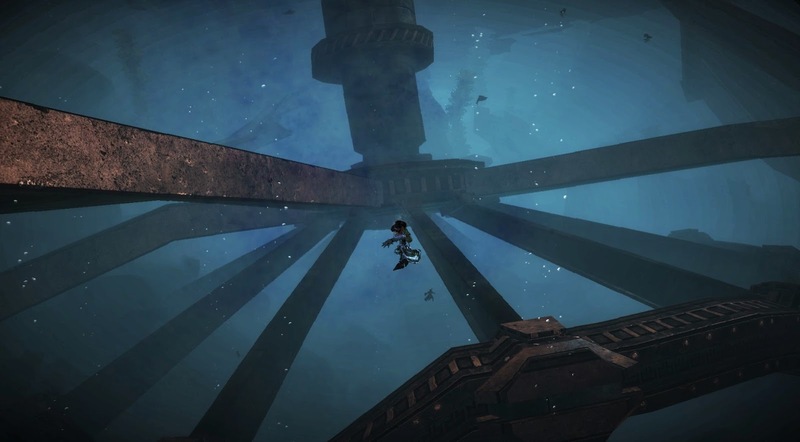 Why should we not expect fine literature in an MMO? I would argue, vehemently, that we can find fine literature in almost every other genre, including many that were long derided as cultural cesspools: comics, television, genre fiction, movies, the lyrics of popular songs... even video games are beginning to attract coherent criticism from beyond the ghetto of the gaming press. Why exempt MMOs from the standards we would use to gauge the success with which a story was told, a mood evoked, a character drawn in any other medium? I think I've been doing a lot of that. Like Jeromai, I've been...content. It's not really good enough, is it? 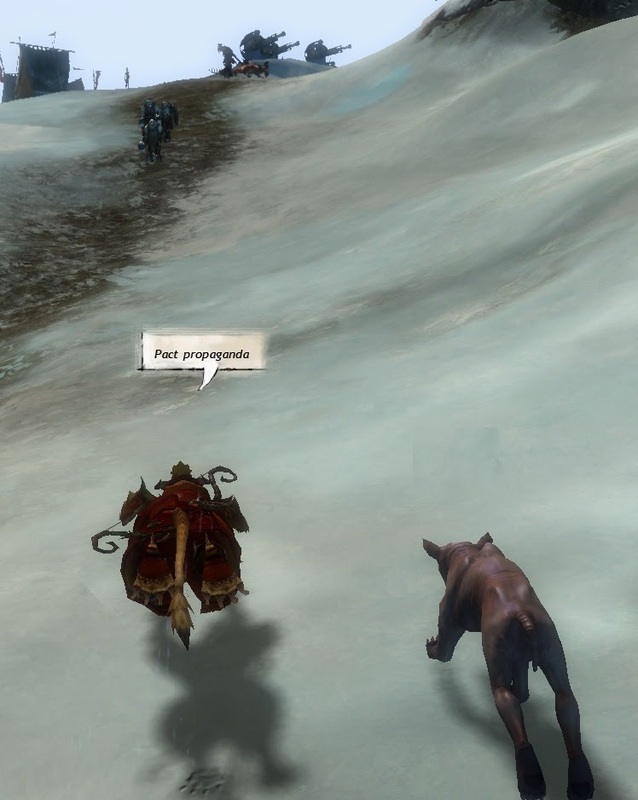 I think I've tended to praise the writing of the Living Story in particular and GW2 in general too highly, rather on the principle of the dog walking on its hind legs - it's not that he does it so well that pleases, it that he manages to do it at all. Just think of the scrap value alone. So, more critical rigor in future, or at least that's the plan. As for whether it's becoming ever-harder to "turn these things into a conversation point", well Zubon at KTR took someone to task recently (towards the end of this comment thread) this for expressing a disinclination to discuss in detail why we like or don't like aspects of our MMOs, his dry reply being that the commenter's position "cuts to the heart of reviewing: some things are good and some are bad. We say good things about the good and bad things about the bad." And that is the thing. When we agree to disagree and acknowledge that much of what we might dispute is really no more than differing tastes (which often is all that it is) then we risk having very little to say to each other at all. There's seeing the other fellow's point of view and then there's refusing to engage. Of course, we can all just post screen-shots. That's always a plan. Looking ahead to where The Living Story goes next and thereby to the prospects for GW2's future I also do think that MMO players steeped in years of playing certain MMOs that worshipped less slavishly at the altar of DIKU-MUD - City of Heroes, the original Guild Wars and Asheron's Call come immediately to mind - have a better understanding of and a higher tolerance for horizontal progression and goals that aren't primarily oriented towards a direct and tangible increase in character power. 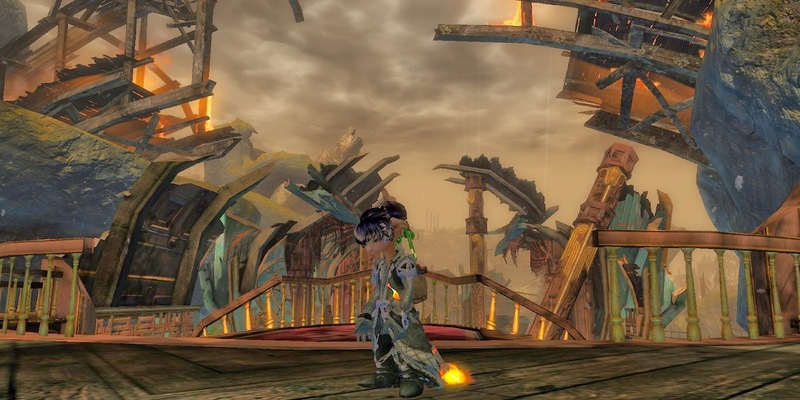 GW2 seems to be trying to straddle that divide and making a reasonable job of it, too, but the absence of a real expansion is a serious and ongoing challenge for that balancing act. Competition this year is going to come partly from MMOs that appear to understand the desire for vertical progression very clearly - WildStar and WoW. The Living Story project has been a brave one but I think few would argue that it's been wholly successful. Whether another round, however well refined and re-tuned, will be sufficient to hold attention this summer we can only wait to see. It's probably true, as Jeromai suggests, that the people who complain about the lack of an expansion (I'm one of them) would be reasonably placated by new races, classes and explorable areas were those to be added through other means, but the problem is that after a year and a half there is no sign whatsoever of that happening. An expansion, even just the announcement of one, gives players confidence that there will be jam tomorrow even if the bread remains dry today. Repairers throughout The Mists are rubbing their hands with glee. Not to mention that I like buying things that plop through my letterbox with a solid THUMP. It's just much more satisfying to get that content delivered in a box all at once than dribbled out invisibly over weeks and months. Even a digital download carries something of the frisson of an actual purchase. Stuff you get free is worth what you paid for it, as the saying goes, or at least there's the risk that that's how your non-paying customers will see it. Anyway, onwards and upwards. We have The Tourney to enjoy before Living Story Season 2 kicks off (is there even a date for Season 2? Will they overlap? If they don't will we really see no new content 'til the Summer?) 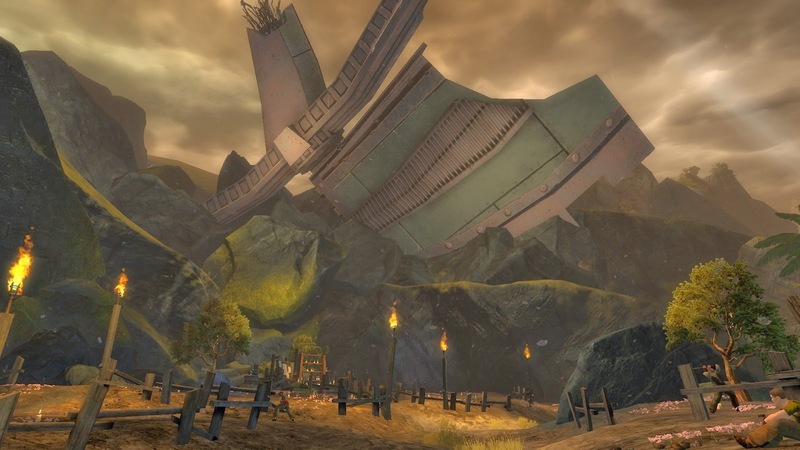 and Ruined Lion's Arch, with the sad music, very nearly pays for all. The fires are out. The fighting is done. It's a victory of sorts. Lion's Arch still stands, barely. Lionguards stand sentry in the shattered shell of the vault. Guarding the money. They have their orders. And their priorities. The Trading Post awaits the return of the King Over The Water. Or the Charr Over The Fields, should we say. Vast fragments of Scarlet's shattered Breachmaker lie everywhere, embedded in the rocks, jutting from the water. Deep beneath the sea the great drill lies still, haloed with flickering auras as stuttering arcs of energy spit from the tip. What these lights portend is not yet known. Across the city makeshift memorials appear. Some of the messages don't bear reading twice. Now it's over (is it over?) the mood of the city turns defiant. These once were pirates. And may be again. In the camps sentiment is hardening. Something huge and terrible and old. It's time to come together. No time to fly apart. Here. See. The real, true heroes of Lion's Arch. If they can do it so can we. Stand strong, Tyrians. Stand together. Darker days are coming. They always do.